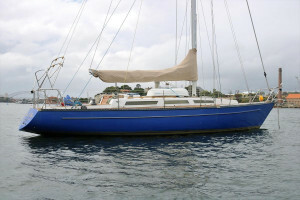 Frers Snr. 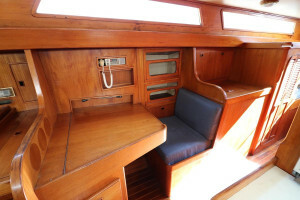 designed and built by Swanson Brothers, this 48 foot cruising yacht was built beside the famous Frers 67' yacht "Dreamtime". 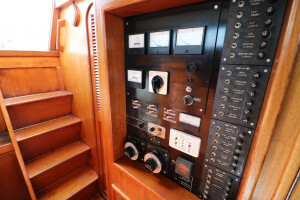 Frers is a world famous yacht designer know for his Nautor Swan and America's Cup designs. 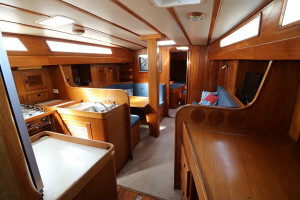 This is a well-proportioned yacht with 2 double cabins and ensuites, very large saloon with dinette, sofa, large navigation station and a large galley. 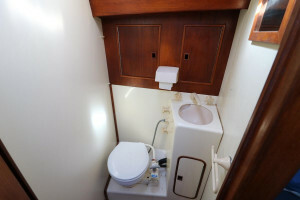 Aft is an additional quarter berth. 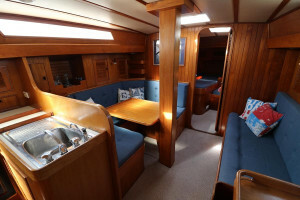 The interior is finished in rich timber all in good condition. 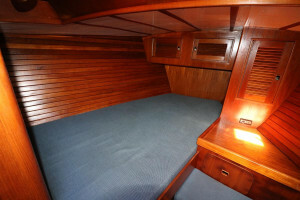 Storage lockers are abundant with plenty of room for any long voyages to stow clothing, provisions making this a tidy vessel. 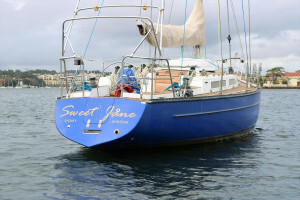 This yacht offers excellent comfort below deck and would be an ideal live-a-board, blue-water cruiser or family cruiser. 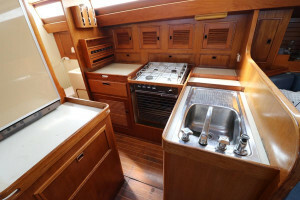 The galley is L-shaped with lots of storage and 4 burner gas stove/oven. 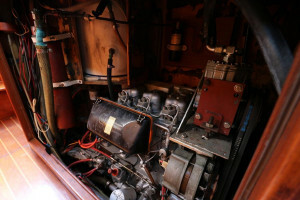 A 12v front opening fridge and large ice box provide good cold storage. 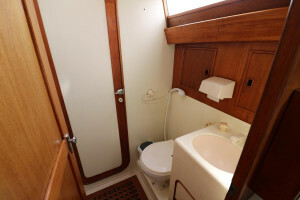 The saloon is bright with generous headroom and well ventilated. 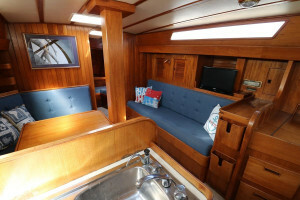 A large dinette and sofa provide comfortable dining and seating for entertaining. 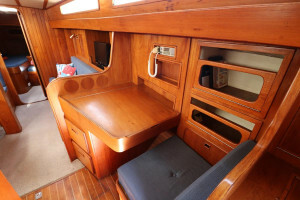 The cockpit has a folding table for outdoor entertaining and an opening transom for good swimming and marina access. 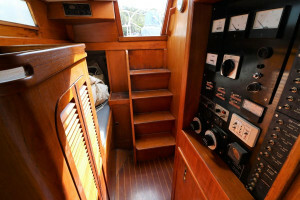 A cockpit locker stows fenders and ropes. 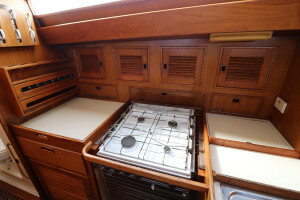 The decks have been re-decked with synthetic Nuteak that give a great look with good grip and low maintenance. 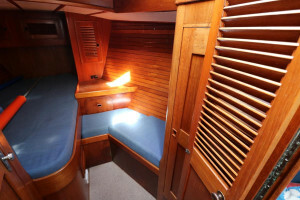 The boats halyards and sheets all lead back to the deep cockpit for ease of handling and safety for short-handed sailing. 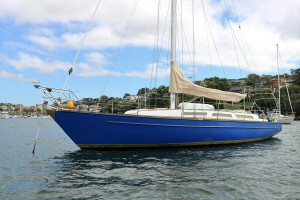 This is an excellent opportunity to buy a Frers Snr. 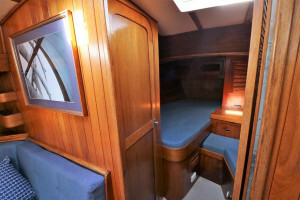 designed yacht with undoubtedly excellent pedigree and performance. 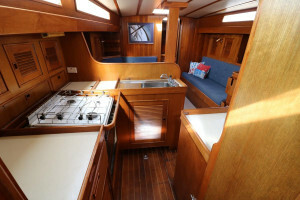 The boat has been prepared for family and coastal cruising with NEW standing rigging. 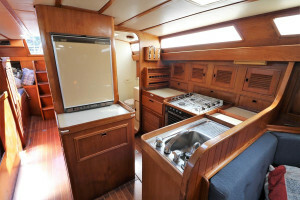 The vendors are regrettably selling due to a change in family plans and have priced the yacht for a quick sale.